I know I haven't been writing in my blog for awhile. But that is because I have several projects in working. For example few American Girl Doll outfits, which will be part of a display at the library in my area. I think I am coming up with some nice knits for these dolls and that children will enjoy the month long "mini show" in December 2013. Stay tuned. 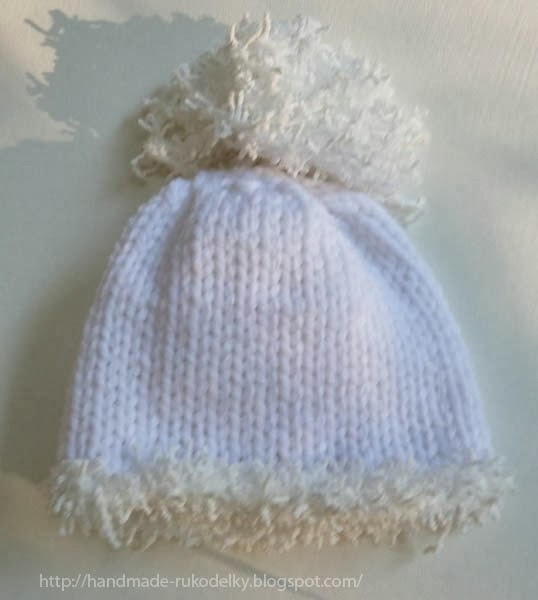 Also, besides painting and drawing, I have been knitting baby hats, which is also my passion (besides making clothes for AGD). As you see in the image to the left, I knitted very simple "Snow White" hat - perfect for winter. It is knitted from thicker acrylic yarn (which will not itch a baby). Since it is fairly simple you could have it done in a couple of hours. If you know how to cast on (CO), bind off (BO), if you know how to do knit (K) and purl (P), if you know how to knit two stitches together (K2tog), if you know how to knit with double pointed needles (DPNs) and how to make a tassel, then you will be able to knit this simplistic hat. If you would like to get this FREE pattern (in .pdf file), drop me a line and I will email it to you. There are few ways to reach me. Via Google+ and via Facebook Page. There is also a CONTACT form in the Menu.